When there's a dynamic duo in the office who deserve a fine treat, our gift experts have created the perfect pick-me-up for them. 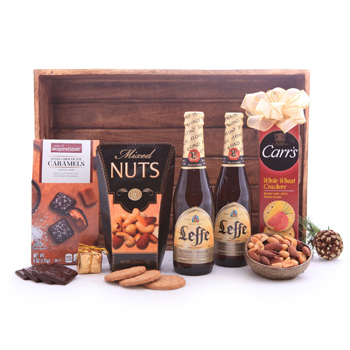 Two bottles of European Beer (330 ml, each) are accompanied by Dark Chocolate Caramels (150 gr. ), crunchy Mixed Nuts (75 gr. ), and more - enough to share. Reward them for hard work, thank them this Christmas with the Beer Starter for Two.